The escalation of the violent protests, which are directed against unemployment and the poor state of communal services, in Basra on September 3 has resulted in several deaths among the protesters, according to Iraq’s Human Rights Commission. One protester died and 11 more were injured during demonstrations in Basra, local security and health sources reported. The Iranian consulate in the al-Barda'iya area of Basra was set on fire and stormed by protesters on September 7, a source told Sputnik. Kurdistan 24 reported that protesters also attacked the US consulate in the city. Demonstrators also stormed a facility of the Lukoil-managed West Qurna 2 oilfield, briefly taking two local employees hostage, Lukoil and local energy police reported later on Friday. Sources from the company and local security forces said the protesters freed the two employees and peacefully left the premises about an hour later. Protesters have stormed several government buildings, as well as the offices a state-funded TV channel on September 6. 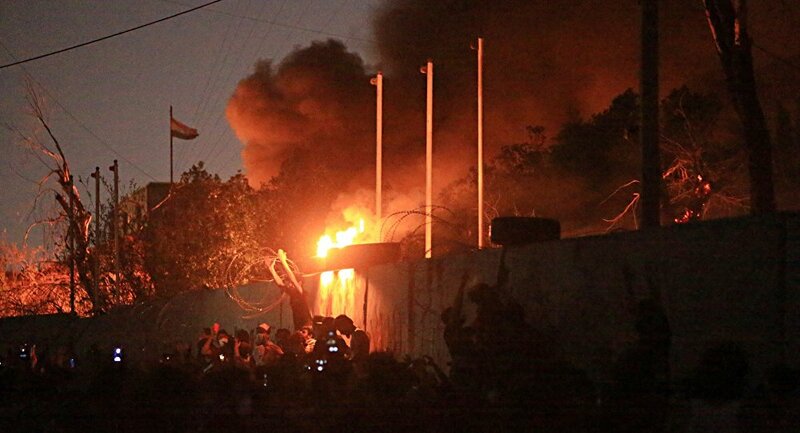 The headquarters of local authorities and political parties have reportedly been set on fire. Protesters have also blocked Iraq's biggest port, Umm Qasr. Basra has been rocked by protests since September 3, with residents demanding that authorities fix the situation with drinkable water and electricity in the city, as well as deal with rising unemployment. At least 10 people have been killed in the protests on both sides and many more injured. The Iraqi government will hold an extraordinary session on September 8 to discuss the situation in Basra.